Two first-half goals see AFC Bournemouth slip to a 2-1 defeat at St James' Park, their first away defeat in the Premier League since September. Solomon Rondon scored a first-half brace, tapping the early opener home from his own rebounded shot then scoring a second shortly before the break with a well-taken header. The half's hat-trick of negative points for the Cherries came when Adam Smith was stretchered off after what at first glanced looked a serious knee injury. The frenetic opening period ended with Jefferson Lerma pulling a goal back for the visitors with a header - his first ever goal for the club - while in the second half chances came and went at both ends without a further goal. Jordon Ibe had the pick of the away openings, unable to convert deep inside the box with the 'keeper bearing down on him. Ibe was brought into the starting line-up for his first league start of the season, with the match getting going after a minute's silence in respect of Remembrance Sunday. Winger Ibe almost made an instant impact, supporting a David Brooks and Callum Wilson break, being teed up in the area. However, his drive from a threatening area inside the box, was superbly blocked by Federico Fernandez. That moment proved crucial as shortly after up the other end, the Cherries conceded the opener. Winning the ball in the middle of the park, the play was moved to the right, DeAndre Yedlin centring low for Rondon. The Venezuelan's first close-range shot was well saved by Asmir Begovic but the striker was able to tuck home the rebound. Soon back on the attack, Brooks felt aggrieved not to win a penalty when receiving a kick from Fernandez after getting to a loose ball first - with the first team staff on the bench perplexed as to how a penalty wasn't awarded. The Cherries were building pressure from that moment, first Callum Wilson wriggled past defenders in the box but couldn't get a shot away, Lewis Cook had a long-range effort deflect over and then Fraser saw a goal-bound effort blocked in the six-yard box. Fraser's then whipped a wide set piece goalbound and forced a superb parry from Martin Dubravka, but there was further bad news for the visitors when, unchallenged, Smith collapsed to the turf holding his knee. It was an innocuous one and he had to leave on a stretcher to be replaced by Charlie Daniels. The away side's momentum curtailed by the long break in play, United scored a second when Rondon thundered home a header from Kenedy's precise left-ring cross with five minutes of the half remaining. Eight minutes of first-half stoppage time were signalled due to Smith's injury and Begovic twice came to the rescue, initially when Kenedy reached a bouncing ball eight yards out and a minute later when following a United free-kick a flick from Wilson was heading into his own net before the Bosnian's superb reaction tipped the ball over and kept the Cherries' deficit at two. However, an action-packed 45 minutes ended with a Bournemouth lifeline. After Dubravka had brilliantly saved from Steve Cook's header, the corner was swung in by Fraser and Lerma stooped to head home his first goal in English football, the ball looping into the far corner of the net from ten yards. 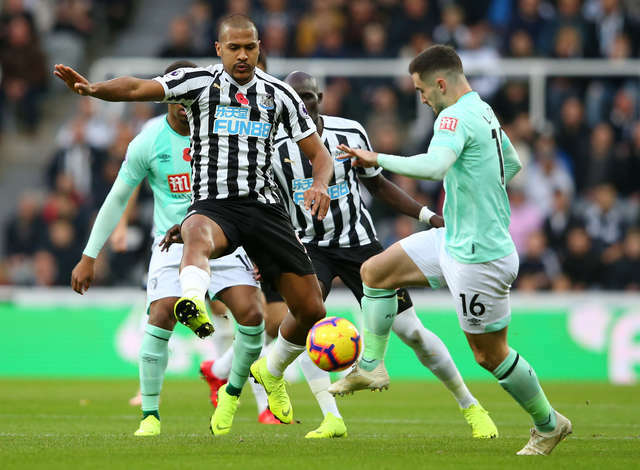 The second period began with the Cherries pushing the accelerator in the pursuit of an equaliser, though Rondon might have done better when presented with a hat-trick chance with a header from Matt Ritchie's cross. Wilson directed a header narrowly wide as the away side continued to attack, but the game was wide open and the game's crucial next game nearly game from the hosts, Ritchie spurning a chance as he swivelled onto a loose ball in the box but missed the target. 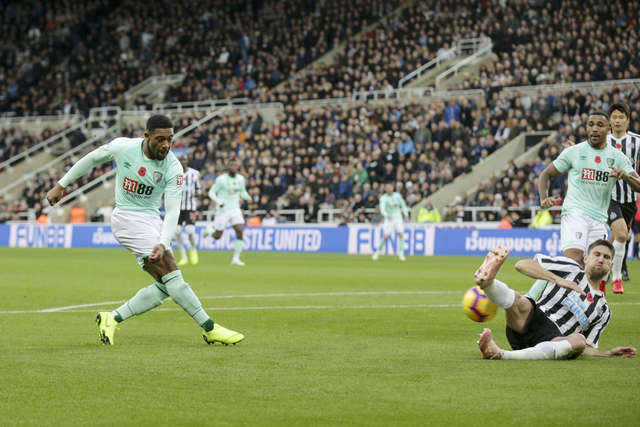 A fine move from the visitors carved open a clear opening soon after, half-time substitute Dan Gosling threading Ibe in behind, but the ball caught under his feet as he beat the Newcastle back line, the winger could only fire over with just the 'keeper to beat. Fraser was instrumental again as he burst through from an angle, his low ball just out of reach for Brooks, with Jermain Defoe introduced with ten minutes to go as the hunt for a second Cherries goal intensified. That intensity was almost rewarded with a deserved equaliser - Nathan Ake forced a brilliant stop from Dubravka from a yard or so following a Brooks shot, and Gosling steamed in to get the rebound over the line but his and the away section's cheers were cut short by an offside flag. Rondon could have sealed the win as he galloped into the box, but Begovic was once again to the rescue making a miraculous save with his foot, just ahead of the signalling of four further minutes to bolt onto the 90. However, there were no further chances for the Cherries, the side heading into the international break on the back of two 2-1 losses. Ahead of kick-off Eddie Howe had asked for a front-foot start from his side, but it was Newcastle who were able to make progress into attacking positions throughout the opening period. The start led a change in shape, notes passed onto the pitch past the half-hour mark as the Cherries' formation switched to three at the back as they looked to tighten up and find a way back into the contest. It continued after the break, Christian Atsu appeared to have scored a decisive fourth goal of the contest, but for Begovic's fine diving save, and Rondon was denied his third late on as his low effort was thwarted by the 'keeper's outstretched leg.